This sounds good. Tune in on Monday evening February 10th for Radio 2 Book Club on Simon Mayo’s Drivetime show, starts at 17.05. 1837: New York is gripped by the pock, and 12 year old Thomas Walker’s mother is taken by the Lord, leaving him with an elderly spinster aunt and a travelling salesman father, whose business selling ‘spectaculars’ to the ladies of Manhattan is on the wane. Seduced by the sales prospects of Samuel Colt’s newly invented revolver, father and son hitch up their old gelding Jude Brown to a Brewster wagon and head out across New Jersey, slowly making their way West. The Road to Reckoning is the poignant story of Thomas Walker’s advent to adulthood; a brutal yet at times beautiful coming-of-age tale played out against the vast wilderness of the Frontier territory. 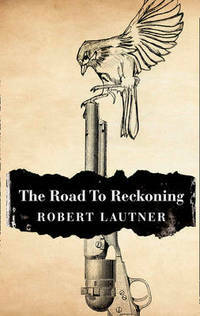 Robert Lautner is the pseudonym for an author of historical adventure fiction. Born in Middlesex in 1970, before becoming a writer Robert owned his own comic book store, worked as a wine merchant, a photographic consultant and a recruitment consultant. He now lives on the Pembrokeshire coast in a wooden cabin with his wife and children. This entry was posted in Book Reviews and tagged Authors, Book Reviews, Radio 2 Book Club, Robert Lautner. Bookmark the permalink.